Before jumping into a home addition project, ask yourself why you want to add on in the first place. Do you want to create a new space, or simply expand an existing room? Are you adding a new living space for family members, or planning to rent it out? Having a clear plan in mind for the future of your addition will help you to plan out the size, style, and layout of your new space. A budget is an important factor in any home improvement project, but it is especially important to set one when planning your addition. Depending on the size of your addition, the job can end up being a good deal more costly than a simple renovation. Having a set budget will make the planning and organizing aspects of your project go much more smoothly, and you won’t have to worry about accidentally building outside of your price range. There’s no shortage of variety when it comes to shapes, layouts, and styles of home additions; the only problem is figuring out which one you want to go with. 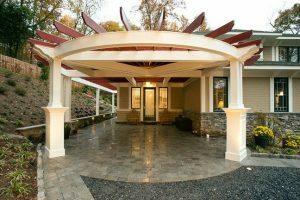 An addition shouldn’t look as though it were just ‘tacked on’ to your home – instead, it should blend seamlessly into the overall design of the house. With that in mind, try to stick closely to the original look and style of your home. Another thing to consider is where to put your addition. Most people immediately think of building out, but building up is another option to consider. If there are certain zoning laws in your area, or if losing yard space is a concern for you, building vertically may be the way to go for you. As mentioned before, you want your addition to blend into the rest of your house, not stick out from it. The easiest way to do this is to match all of the outside materials such as the roofing, siding and window or door frames. If you can’t find exact matches, consider a color or style that complements the rest of your house instead. Good contractors use fair pricing. It can be tempting to go for the cheapest contractor that you can find, but this is always a bad move. Shady contracting companies often try to get business by underselling the competition, and in return you’ll get a shoddy job done on your home. On the other hand, there are companies that will charge far too much for the work they do. Finding a fair contractor can be a daunting task, but by doing your research and comparing customer reviews and ratings, you can find a contracting team that is both affordable and reliable. A good contractor will take the time to listen. Being able to communicate with your contracting team is essential to having your project done the way you want it to be. Your contractor should offer his professional advice, but be open to creative ideas as well. If you’re looking for a professional, dependable contracting team in the Maryland area, contact us today. Our team is dedicated to helping you create the home you’ve always wanted, by giving you the help and support you need.